Ministry of Labour and Employment, Government of India has launched a health insurance scheme for BPL families which is called Rashtriya Swasthya Bima Yojana (RSBY). ** The beneficiary is any Below Poverty Line (BPL) family, whose information is included in the district BPL list prepared by the State government. ** The eligible family needs to come to the enrollment station, and the identity of the household head needs to be confirmed by the authorized official. ** There is no age limit in RSBY and anybody can be enrolled if they are in the BPL list. ** Rashtriya Swasthya Bima Yojana provides cover for hospitalization expenses upto Rs. 30,000/- for a family of five on a floater basis. ** Transportation charges are also covered upto a maximum of Rs. 1,000/- with Rs. 100/- per visit. ** The premium for RSBY is different in different set of districts. ** State Governments select insurance companies through open tendering process and technically qualified lowest bid is selected. ** Smart card is used for a variety of activities like identification of the beneficiary through photograph and fingerprints, information regarding the patient. The most important function of the smart card is that it enables cashless transactions at the empanelled hospital and portability of benefits across the country. ** An electronic list of eligible BPL households is provided to the insurer, using a pre-specified data format. ** An enrollment schedule for each village along with dates is prepared by the insurance company with the help of the district level officials. ** As per the schedule, the BPL list is posted in each village at enrollment station and prominent places prior to the enrollment and the date and location of the enrolment in the village is publicized in advance. ** Mobile enrollment stations are set up at local centers (e.g., public schools) in each village. 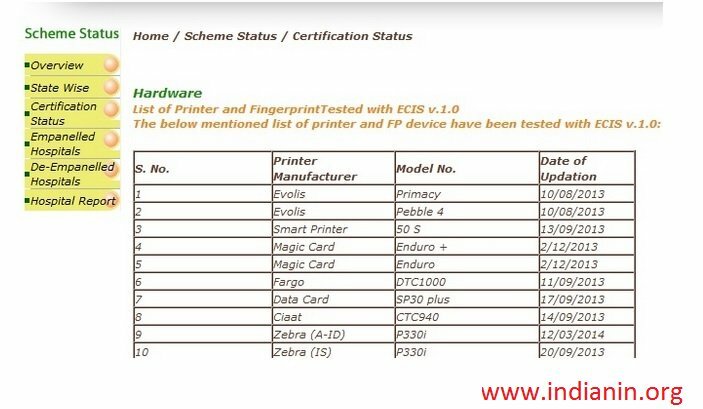 ** These stations are equipped by the insurer with the hardware required to collect biometric information (fingerprints) and photographs of the members of the household covered and a printer to print smart cards with a photo. 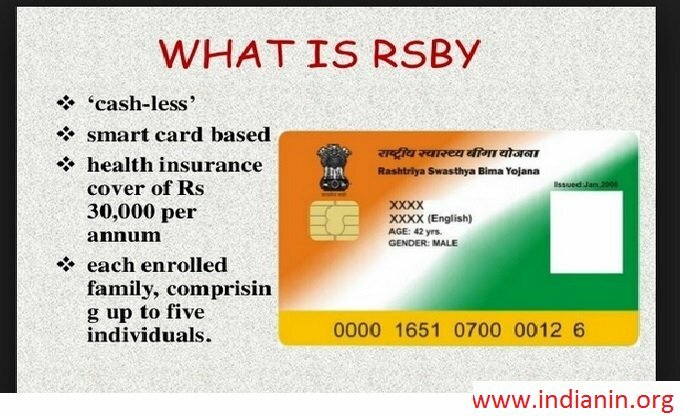 ** The smart card, along with an information pamphlet, describing the scheme and the list of hospitals, is provided on the spot once the beneficiary has paid the 30 rupee fee and the concerned Government Officer has authenticated the smart card. ** The process normally takes less than ten minutes. The cards shall be handed over in a plastic cover. ** Each enrolment team in the villages is accompanied by a Field Key Officer (FKO) who identifies the beneficiaries at the time of enrollment. ** FKO is also provided with a smart card and his job is to identify the beneficiary and authenticate their smart card by his FKO card and finger print. ** Without FKO’s authentication the smart card with the beneficiary will not work. ** The detail of each family which is authenticated by the FKO also gets copied in the FKO card and insurance company is paid based on the number of beneficiaries obtained from the FKO card. ** In case of new policy, the Scheme shall commence operation from the 1st of the succeeding month in which the smart card is issued. ** Thus, for example, if the initial smart cards are issued anytime during the month of April in a particular district the scheme will commence from 1st of May. ** The scheme will last for one year till 30th of April of next year. ** This would be the terminal date of the scheme in that particular district. ** However, in the same example, if the card is issued in the month of May, June and July then the insurance will immediately start from the next day itself for the beneficiaries and policy will be over on 30th April of next year. ** Thus, all cards issued in the district in May will also have the Policy start date as 1st of May (even if issued subsequent to the date) and terminal date as 30th April of the following year. ** In the case of renewal, the policy will start from first of the next month in which the earlier policy will expire. ** Therefore, for example, if the earlier policy is getting over on 30th April and card is renewed in the month of April then the new policy will start only from the 1st May and will finish on 30th April of next year. ** Beneficiaries need to pay Rs. 30 per family at the time of enrollment. Go to the above link click on the “Scheme Status” option. 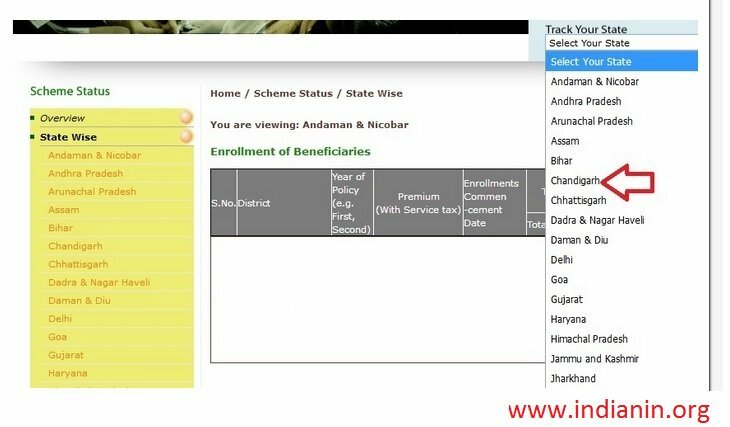 Go to the official website,click on the “Scheme Status” tab in main menu, drop down list will be displayed,click on the “state wise” option. Then Select your state in track box result will be displayed on the Screen. Go to the official website,click on the “Scheme Status” tab in main menu, drop down list will be displayed,click on the “Certification Status” option. Status will be displayed on the screen. Central Grievance Redressal Management System (CGRMS) is system that ensures that the grievance relating to RSBY is disposed by the use of ICT which automatically tracks and pursues the status. CGRMS is system that ensures that the grievance relating to RSBY is disposed by the use of ICT which automatically tracks and pursues the status. CGRMS stands for Central Grievance Redressal Management System.The purpose of the application is to help the beneficiaries and other stakeholders of RSBY scheme to register any complaint related to RSBY and get it redressed. 23. Click on Submit button. How can one track the complaint details? Once registereda unique Token Number UCN will be alloted to the complainant by referring which the comaplaint status can be tracked.In the Home page one can enter the UCN number and view the status. How to register a complaint through email? How to view the matrix details? Escalation Matrix defines the Action Taking Authorities and Escalating Authorities as per the complaint type.All these authorities are supposed to take redressal action within a defined standrad action taking hour. What is the mechanism of complaint redressal? Once registeredthe complaint details will be forwarded automatically through the system to the ACTION TAKING AUTHORITYas defined in Escalation Matrix. What is Escalation Matrix ? What will happen if the Action Taking Authority does not redress the complaint? System will automatically escalate the complaint details to the next higher Action Taking Authorityknow as Escalation Authority. Who is the Nodal Agency? Who will be benifitted from the application? Can the enrollment be done if FKOs are not present at the enrollment station? No. RSBY mandates the presence of FKOs at the enrollment station for the enrollment process. Whom do they need to pay Rs. 30 and when? They need to pay at the time of enrollment to the representative of the insurer. Why should beneficiary pay Rs. 30 if the Government is paying the premium? This Rs. 30 is only registration fee and Government is paying the premium. This amount is used by Nodal agency to take care of administrative expenses. Will the beneficiary get Rs. 30 back at the end of the year if he/she does not use services during the year? No money is returned at the end of the year even if services are not availed. Will Rs. 30/- need to be paid again at the time of renewal of the policy by the beneficiary? Yes. Rs. 30/- is the yearly registration fee which the beneficiary will have to pay each time the policy is renewed. Social Security and healthcare assurance for all has been the motto of Government of India, and it has taken various steps in this regard. One of the most important policy milestones is the Unorganized Workers Social Security Act (2008) enacted by the Central Government to provide for the social security and welfare of the unorganized workers. This act recommends that the Central Government provide social security schemes to mitigate risks due to disability, health shocks, maternity and old age which all unorganized workers get exposed to and are likely to suffer from.